Most companies want to achieve customer driven value with their Six Sigma initiative. They want customers to express both a strong demand for and a great satisfaction with their work. The set of product or service features that customers truly desire is called the voice of the customer (VOC). Customers decide what they want; your job as the producer is to listen to the VOC. Your customer is the final authority on what is and isn’t valuable, but gauging whether you’re on the right track can be tricky. In Six Sigma jargon, you classify a feature or process step that truly adds value from the customer’s perspective as value add. Features or process steps that do not add value are simply called non-value add or sometimes NVA. Does the process step, task, or feature in question change the form, fit, or function of the item being created for the customer? Is the feature created correctly, or is the process step or task performed correctly the first time? 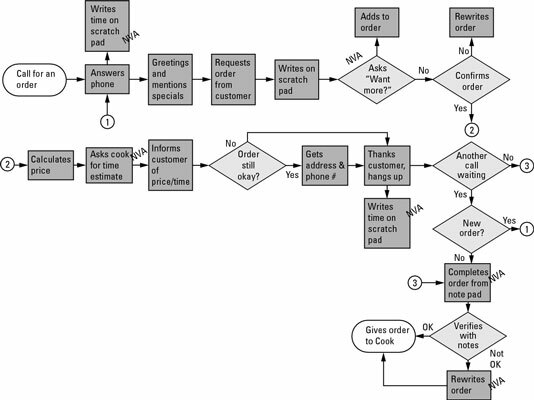 Is the customer willing to pay for the process step, task, or feature? Unless the process step, task, or feature in question generates a “yes” answer to all three of these questions, you characterize it as non-value add. And if it’s not adding value, it must be waste. As you begin to analyze your process or product, simply review each process step or feature and ask these three value questions. All the non-value adding waste in a process or product falls into one or more of seven distinct categories. Knowing these categories is a great help when you’re analyzing your process or product and looking for opportunities to make improvements. T: Transportation: When parts, material, or information must be moved to continue a process, you know waste has entered your system. One of the criteria for adding value is a change in the form, fit, or function of the item; transportation by itself definitely doesn’t meet that description, so immediately you know that this activity must be waste. W: Waiting: Whenever a person, a part, a material, information, or equipment sits idle without something being done to it, it’s waiting. Waiting doesn’t add value, so it’s wasteful. O: Overproduction: Overproduction occurs when, in anticipation of a future need, you purposely produce more of an item than is presently needed. The problem with overproduction is that it always creates other waste such as waiting or inventory. Even though getting ahead is tempting, overproducing typically creates more waste than it’s worth. D: Defects: Producing a defective item means you have to rework or scrap it. Not only is the original effort waste, but you also have to expend extra resources to remake the item. I: Inventory: Raw materials in storage, items in-process on the production line, backlogs of information, and finished goods waiting to be shipped are all inventory. These items do not bring value to the customer by taking up space and consuming resources to maintain. They do not fit the three value criteria questions, so inventory is, by definition, waste. M: Motion: A process that requires people or equipment to move or walk more than is minimally required to produce a product, feature, and so on is waste. E: Extra processing: When you perform more work on an item than is needed, you’re creating extra processing, which is a kind of waste. Memorize this list. Then, as you carefully watch, analyze, and work within processes, you can begin to recognize waste in all its specific and myriad forms. Process steps that do not add true value are labeled NVA. Noriaki Kano is a Japanese engineer and quality professional who developed a now-famous model for characterizing the various requirements from your customer. Kano believed that not all customer requirements are created equal. Some create higher levels of customer satisfaction than others. 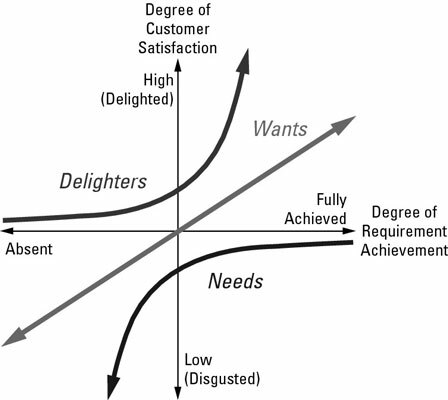 In Kano’s model, the horizontal axis represents the level to which you meet a customer requirement. The more you fulfill the requirement, the farther you are to the right of the axis; the less you fulfill it, the more you are to the left. The vertical axis represents the degree of satisfaction the customer experiences from how well or completely you meet the requirement. In the middle of this vertical customer satisfaction axis is a neutral point where the customer is neither satisfied nor dissatisfied by your performance. Needs: Needs are expected requirements that the customer assumes will be in your product or process; they’re such a given that even when you fully achieve them, the customer’s satisfaction is only neutral. When you don’t fully achieve this type of requirement, the customer is dissatisfied. Wants: These one-dimensional requirements are the stated requirements from the customer. The customer is either satisfied or dissatisfied in direct proportion to how fully you achieve or fail to achieve these requirements. Delighters: Exciting requirements, or delighters, are those expectations that the customer hasn’t anticipated and may not even be aware of. Failing to deliver them doesn’t cost you because the customer wasn’t expecting them. But as you identify and deliver on these requirements, you quickly satisfy the customer, perhaps to the point of surprising and impressing him or her. Identifying and achieving delighter characteristics is critical to business success. Kano’s model helps you evaluate the set of requirements from your customer and understand what mix of performance on these requirements will delight the customer overall. This knowledge puts you in control of differentiating your company from competitors and can lead you to great market success.